Sometimes you get a serendipitous coming together of your work with something in the culture. This week I’ve been clocking up the miles doing social research in some of the less frequented corners of the land, interviewing financially vulnerable people at home; and last night, the smell of second-hand roll-up smoke from the Welsh Valleys still in my clothes, I caught Theatre Alibi’s Curiosity Shop at the Oxford Playhouse. Both experiences provoked reflection on how people get by – and get exploited – when trying to survive below the breadline. The play is an adaptation of Dickens’ The Old Curiosity Shop, set in contemporary East London. 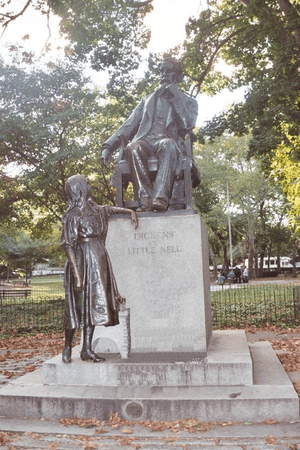 What’s striking is how believable the Victorian tale of human decency and spirit amidst loan sharking, penury and thwarted potential is in a modern East End setting. The transposing into the story of modern devices (both literal and theatrical) by Theatre Alibi is ingenious, from crap (or is he?) hip-hop artiste “The Swiveller”‘s YouTube video, to the village pub Kiss tribute act, to Nell’s symbolic dropping of her mobile into a pond that heralds the start of her retreat from the world. The acting and all-round artistic vision of the Theatre Alibi group was once again brilliant – living up to the high standards they set in the truly amazing Crowstarver (among the best things I’ve seen on stage). There are laughs in there too: they keep it as broad as the subject matter demands while eschewing easy clowning; it’s the sharply observed language and physical characterisations that carry this off so well. A few years ago, it might have taken an imaginative leap for an audience to relate to the situation of Nell and her feckless if well-meaning grandfather (here, an ageing hippy running a record shop). It might have been one only for the historians, Dickens enthusiasts or Guardianista bien pensants, with only tangential relevance for mainstream modern life. But in 2013 Budget week, the tale of rent arrears and unscrupulous landlords, compounded by the hopeless Peter Shilton-esque gambling of the grandfather, seemed at the heart of the present-day British story. As ever, I can’t write directly about the content of my research work here. But meeting people this week who have been through experiences not dissimilar from those depicted in Curiosity Shop has been hugely interesting both personally and professionally – an eye-opener at times even for a hardened old researcher like me. The play was, in a sense, picking up the strands of half-formed thoughts in my head from my interviews and weaving something dramatic with them. And when I got home, I found Curiosity Shop had me watching Question Time a little differently too. Suffice to say, there is a certain author I find myself less inclined to read from now on (naming no names, but it rhymes with Panthony Porowitz). But whoever said being a writer made you more empathetic? It was probably me. This isn’t placing the lives of the least well-off on some kind of pedestal, like Jarvis Cocker‘s moneyed Greek art school student in Common People. It remains crap to have not much money and it’s getting worse. 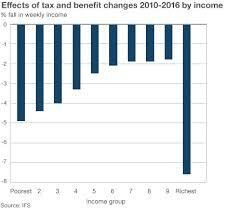 Figures I looked at yesterday from the Institute of Fiscal Studies show how, while the rich are bearing a big hit from the changes to taxes and benefits, the next biggest group to be affected are the poorest. The impact of course is devastating for this group, in a way that it just isn’t for the top 10 per cent. At this end of the income scale, there is just no fat to trim. Hard times indeed. This entry was posted in 21st Century Britain, Society and tagged Britain, culture, politics, qualitative research, society, theatre. Bookmark the permalink.